One of the big problems I have with Skype is its lack of a scheduling feature.Â I have a Skype dual phone which will ring when someone calls me on Skype, but I donât want the phone ringing in the middle of the night because someone from another time zone sees my status as âOnlineâ decides to call.Â I use Skype frequently for work with virtual teams, so I canât just turn it off because I donât want to forget to turn it back on.Â My status should show as âAwayâ when I havenât used my PC for a while, but this isnât always consistent and it doesnât cater for insomnia-induced tinkering on the pc. Ideally, Skype would have a feature to set âOpening Hoursâ on your accountâI only want to show up as available between 8am and 8pm.Â I bought the Pamela extra which does some scheduling, but you can set only one event per dayâie. I can set it to go offline at 8pm, but not to turn back on at 8am. 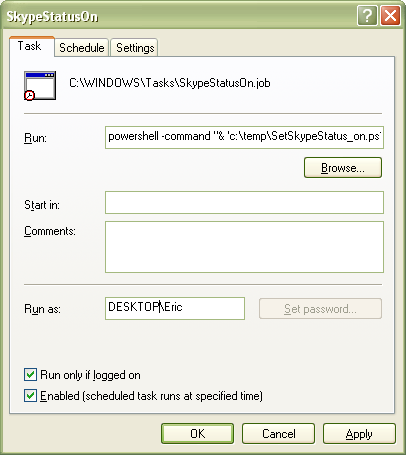 Since Skype offers a client API component, it is possible to create a scheduler to set your online status at different times using Windows Scheduler and a scripting tool.Â I wrote this before in VBScript, but this being the dawn of Windows 7 with pre-installed PowerShell, I rewrote it as a PowerShell script. If you are on XP or Vista and havenât installed PowerShell, you will need to do this before you can run these scripts.Â Installation instructions for PowerShell are here.Â You will also need to set the execution policy.Â You can find instructions for this here.Â I am running XP. 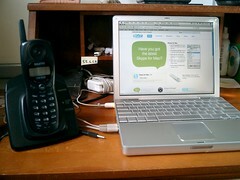 Skype still uses a COM component called Skype4Com which needs to be downloaded and registered on your local PC.Â The component can be found at https://developer.skype.com/Download.Â Iâm using version 1.0.32, but you can probably use a later version. Now, write the PowerShell script to use the component.Â Iâve created two scriptsâone sets my status to âOnlineâ, the other sets it to âOfflineâ.Â You can probably create a single script with a parameter passed in if you wish (but I couldnât be bothered to figure out how to do this). In the script, you have to create the Skype object, identify the current user, and change the status. 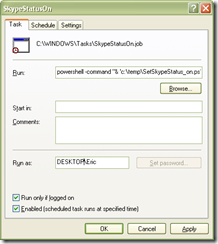 2: $skype = New-Object -COM "Skype4COM.Skype"
The main Skype call here is the âChangeUserStatusâ method.Â I named the first script âSetSkypeStatus_on.ps1â. I named the second script âSetSkypeStatus_off.ps1â. Of course, you can automate most actions on the Skype client using the component (not just setting your online status).Â You can schedule calls, send text messages, etc.Â But Iâm only concerned with my online status. Now you have two scripts to go Offline and Online.Â You just need to have something trigger them.Â I use Windows Scheduled Tasks.Â In Control Panel, go to the Scheduled Tasks window.Â Youâll see a list of scheduled tasks for your pc.Â Right client and select âAddââ>âScheduled Taskâ (Donât go through the âAdd Scheduled Taskâ wizard).Â Name your task âSkypeStatusOnâ.Â Right-click the task and choose âPropertiesâ. Make sure the path is pointed to you PowerShell script youâve created. You can now use the âScheduleâ tab to schedule when you want the script to run.Â Click âOKâ. Now do the same for the other script.Â You can test these scripts by right-clicking the task and selecting âRunâ.Â You should be able to watch your Skype status go from offline to online. By the way, the first time you run this, Skype will ask if you want PowerShell to have access to Skype.Â Click âAllowâ. If everything works successfully, your pc should set your online status and give you the âOpening Hoursâ that Skype forgot.